Definition at line 58 of file defrag-hash.h. Definition at line 60 of file defrag-hash.h. Definition at line 59 of file defrag-hash.h. Definition at line 61 of file defrag-hash.h. 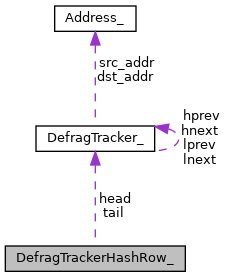 Referenced by DefragGetTrackerFromHash(), DefragLookupTrackerFromHash(), and DefragTimeoutHash().